I couldn't believe my luck when I found this Nanette Lepore blouse for only $25 and Steve Madden sneakers for $30 at Marshall's. They are such on-trend pieces, with the embroidered flowers on the top and the espadrille-bottoms on the shoes. My mom surprised me with this AMAZING jumpsuit from Target and I wore it to my college graduation party (it's perfect colors for University of Illinois). Unfortunately I can't find it online but I linked a few similar jumpsuits and if you are lucky maybe you will find it on the racks at your local Target. Since the jumpsuit makes such a statement on its own, I accessorized it with simple pieces like delicate gold jewelry and sandals. Marshall's does it again! I found this dress that includes lots of my favorite trends this season, like frayed denim, stripes and the off-shoulder style. I wore it to an outdoor graduation party and dressed it up with the summery straw clutch. To me, nothing screams summer more than a white bikini. I found this one at Target and I love the bows on the top and pucker fabric. 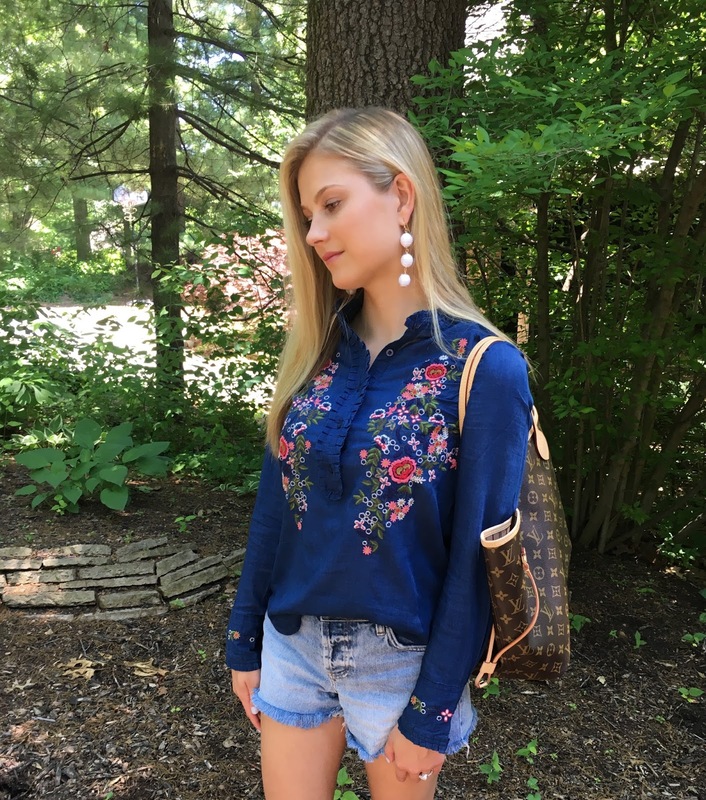 I hope to continue these Instagram roundups to share more of my everyday style, and if you are interested in more of my outfits on Instagram, check out my new "Shop" section on my blog! Happy almost Memorial Day weekend!! To me, the holiday signifies the beginning of my favorite summer traditions — barbecuing and swimming with the family, playing tennis every day, and eating all of the snow cones and ice cream in sight! And of course, I want to do all of these things in style! 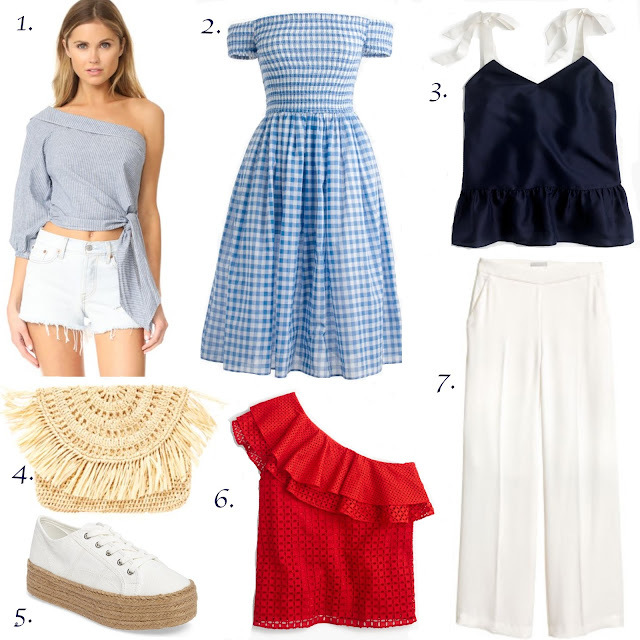 This weekend, I want to channel all-American vibes with patriotic colors, classic silhouettes like an A-line dress and high-waisted white pants, and nostalgic patterns like gingham and seersucker. A straw clutch and white sneakers with an espadrille-twist keep the classic looks on trend. Wow. 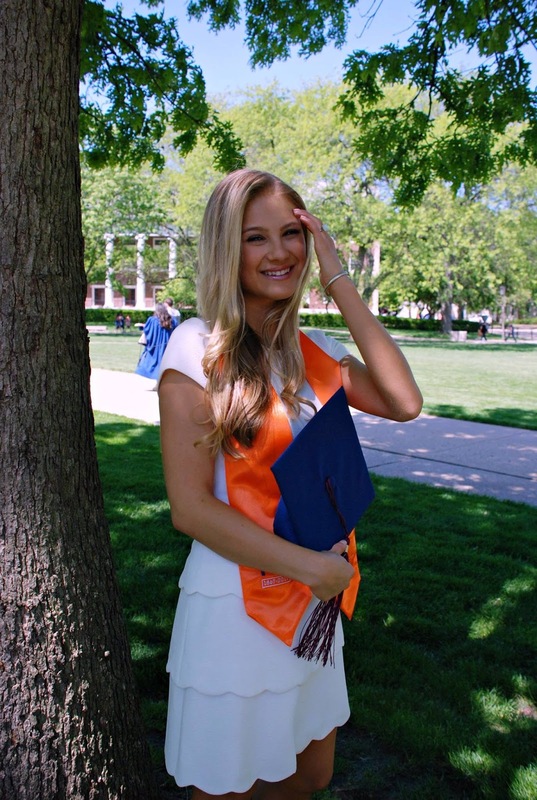 I never thought the day would come where I would be writing this post, but I graduated from the University of Illinois on Sunday! It was a wonderful weekend spent with my family and friends, reminiscing, visiting my favorite campus buildings and restaurants, and obviously, celebrating (a.k.a. lots of champagne!) When picking out a graduation dress, I strictly looked at white options because the color pops so well against my school's royal blue gown and bright orange stole. 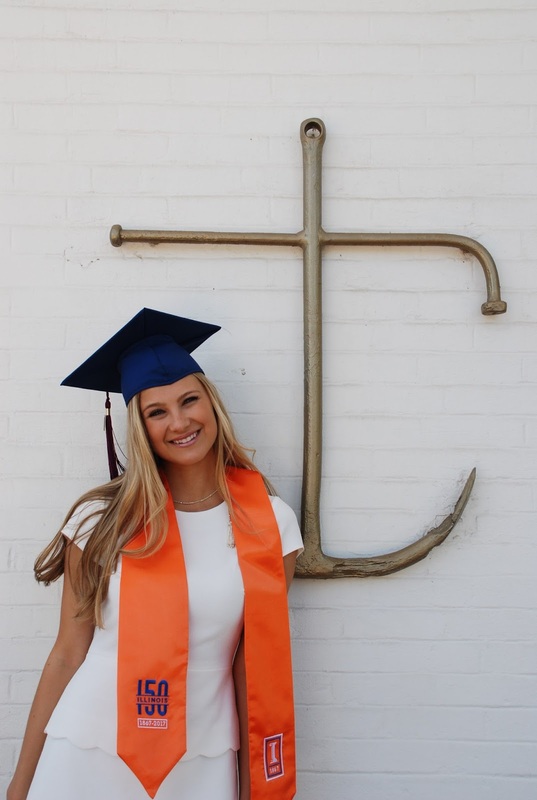 I definitely recommend choosing a solid-colored dress that complements the school colors, but I did see lots of cute patterned dresses at graduation that incorporated orange and blue and looked great! This Club Monaco dress was love at first sight. It is so preppy and ladylike with the scalloped tiers, and it also has a cute cut-out in the back! It is such a versatile style that I will wear to work this summer as well. I also have to talk about this sparkly necklace from Kendra Scott! My mom gave it to me as an Easter gift and she thought it would be festive for graduation since the tassels were like the ones on my graduation cap. She was right but I know I will be wearing it with lots of my summer outfits! Lastly, for any of my followers who are graduating this month too, congrats and good luck! Real world, here we come!! Neutrals with a Pop of Pink! I have been wanting a pair of earrings like these for months but couldn't justify spending $50 to 100+ on them. Lucky for me, I went to Target to buy mascara and came across the SAME earrings for only $10.39!! And yes, I get very sidetracked at Target! I love the white earrings because they will match nearly all of my summer dresses but they also come in black and white stripes, royal blue and turquoise. I was even more excited to learn that BaubleBar teamed up with Target to create this line of trendy but reasonably priced jewelry called SUGARFIX. There are lots of other cute styles like tassel earrings and sparkly chokers. You can shop the full collection here. As for my outfit, I went for a casual but polished vibe, perfect for those last few days of studying before summer. During the day, I will more likely wear pearls but switch to the white statement earrings at night to dress up the look. Click to shop my other SUGARFIX faves! It's officially May which means it's the start of party season! Whether it be college formals, weddings, graduation parties, or even just Mother's Day brunch, there's a high chance you will be needing a dress this month. I graduate from the University of Illinois this month so I'm sure this orange and blue look shown above will be on major repeat. I've rounded up some of my favorite styles of the season — think bold colors like yellow and red and girly details like off-shoulder necklines and embroidered flowers. I've also included some more structured dresses with higher necklines and lower hems, which are guaranteed to be timeless and elegant for a graduation ceremony. Ready, set, get shopping! Click on the dresses to shop!